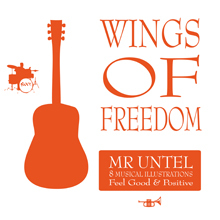 Wings of Freedom, a brand new album specialy designed for image synch is featuring a set of 8 titles with Pop Rock Folk sounds blended with parts of electric and acoustic guitars on solid bass rhythmics and drums. A classical strings section often responds to merry trumpet or selected Guitar and Dobro solos. The mood is always positive with a sense of permanent well-being. Perfect for news reporting or documentary. Free promo pack available.